Gujarat-based PurpleDocs, a healthcare records management startup, has raised an undisclosed amount of funding from investors including KellyGamma, Lead Angels and a few high net-worth individuals (HNIs). The startup will use the funds to expand its operations in the national capital region (NCR), Maharashtra and Karnataka and to enhance its technology. The development was reported by The Economic Times on Wednesday, quoting the startup's chief executive and founder Deepak Gupta. Founded in 2010 by Gupta and Pooja Gupta, PurpleDocs offers hospitals a patient records management platform. It is currently operational in Surat, Ahmedabad, Rajkot and Vadodara and has over 60 hospitals as its clients. The firm was initially bootstrapped and incubated at the International Centre for Entrepreneurship and Technology (iCreate). Other companies in the space are Hyderabad-based Aayuv Technologies Pvt Ptd, which operates healthcare technology startup eKincare. It secured Rs 2.2 crore ($330,000) in a pre-Series A round of funding in March this year from existing investor BitKemy Ventures, Maheshwari Investments Pvt Ltd and HNI investors Anshoo Gaur (head of Amdocs in India), Rama Krishna Reddy and Sandeep Seerapu. 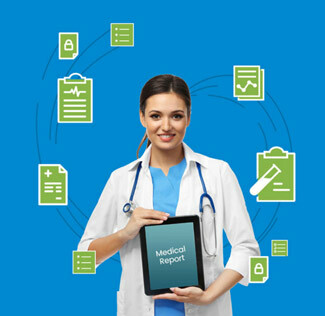 eKincare provides a platform for users to store their family's health records in one place and can be accessible from anywhere, anytime using a computer, smartphone or a tablet. Gurgaon-based Kleeto raised Rs 1.5 crore a pre-series A round from a group of investors last year. While it digitises the documents for individuals and companies, it also stores physical documents in warehouses.